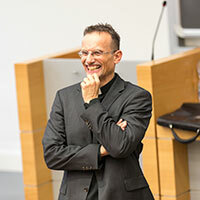 On 1 November 2016, the Catholic Church and the Orthodox Churches will host a special address by Professor Philipp Renczes, a Jesuit priest from Germany. Entitled, ‘Breathing with two lungs: The Ecumenical journey of the Catholic Church and the Orthodox Churches, in particular with the Antiochan Orthodox and the Oriental Churches’. All are welcome to attend this special event hosted by the Australian Catholic Bishops Commission for Ecumenism and Inter-religious Relations (BCEIR) and the Conference of Bishops and Representatives of the Middle Eastern Apostolic Churches in Australia and New Zealand. It will take place at the Chaldean Catholic Eparchy of St Thomas the Apostle, Bossley Park, NSW, commencing at 7.30pm. This entry was posted in ACBC agency news, Bishops, Special interest and tagged Dialogue, Ecumenism, Inter-religious relations, Lecture, Orthodox Churches on October 31, 2016 by ACBC Communications. 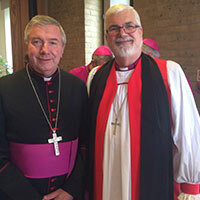 Joint letter by Archbishop Christopher Prowse, Catholic Archbishop of Canberra and Goulburn and Bishop John Parkes, Anglican Bishop of Wangaratta (pictured on the left). Representing the Anglican and Roman Catholic communities of Australia, we have returned recently from our anniversary pilgrimage in Canterbury (England) and Rome (Italy). It has been 50 years now since Archbishop Michael Ramsay and Pope Paul VI met to begin formally, the worldwide Anglican/Roman Catholic ecumenical dialogue. This entry was posted in Bishops, Special interest and tagged Ecumenism, Inter-religious relations on October 11, 2016 by ACBC Communications.